Australia faces a T-intersection: time to resolve our refugee crisis. Liberal member for McMillan in Gippsland, Russell Broadbent, challenged his own political party sharply, as well as Australia’s detention policies for refugees on Manus Island and Nauru, saying that Australians were finding it quite ‘unacceptable’ that we treat refugees so badly, keeping them in prison-like conditions in harsh, remote, and at times dangerous conditions. Australia’s reputation for decency and upholding human rights was being badly damaged internationally. Some asylum seekers had been in detention for up to seven years, though guilty of no crime. Mr Broadbent was speaking at the launch of Bridging Troubled Waters: Australia and Asylum Seekers by Dr Tony Ward on 21 September at the Multicultural Hub in Melbourne. His speech was reported in both The Sydney Morning Herald and The Sunday Age on 24 September, as well as The Sun-Herald, and was mentioned on Barrie Cassidy’s Insiders program on the ABC. Economics Editor, Peter Martin, in The Age and Sydney Morning Herald wrote a feature article on 31 August, ‘The appalling mathematics of offshore detention’, drawing from Bridging Troubled Waters. Dr Ward wrote this book in collaboration with Ms Caz Coleman, who has extensive experience working with asylum seekers and has been an adviser on various government committees on refugees. For some years she was Director of the Hotham Mission Asylum Seeker Project in Melbourne, then managed the transitional welfare services on Nauru in 2013 and more recently was Director of Melaleuca Refugee Centre in Darwin. Ward is a Research Fellow in History at the University of Melbourne and principal in the economics consulting firm, Milbur Consulting. He has condensed into 252 pages an account of the complex twists and turns in refugee policy since the 1990s, combining a lucid historical account with detailed analysis of the economic costs, along with the human costs on the refugees themselves. This is not a political diatribe, but a careful professional critique of Australia’s response to refugees arriving by boat, with positive evaluations of community processing of refugees and resettlement schemes. He makes proposals about how Australia can better manage refugee movements, close Manus Island and Nauru detention centres, and with regional and international cooperation, maintain tight border controls. Bridging Troubled Waters began as a project of the Yarra Institute for Religion and Social Policy, with funding from the Good Shepherd Australia New Zealand. Tony Ward produced an initial report Long-Term Health Costs of Extended Mandatory Detention of Asylum Seekers in October 2011, which was launched at St Brigid’s church, North Fitzroy, by Rev Alistair Macrae, President of the National Assembly of the Uniting Church of Australia. 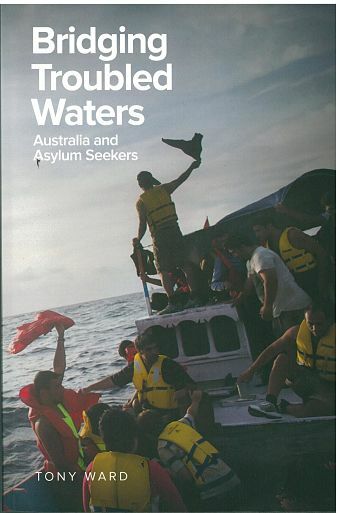 Dr Ward and Caz Coleman worked collaboratively writing an earlier draft of this book, which publishers were reluctant to accept, in part because of the rapidly changing politics and policies on asylum seekers. With the refugee issues drawing to a head, Australian Scholarly Publishing has produced this fine book by Tony, with Caz intending to write further on aspects of community processing and refugee resettlement. The chair of the Yarra Institute, Rev Dr Stephen Ames, thanked Mr Broadbent for his incisive address, and Caz Coleman and Tony Ward for this very timely publication. Social Policy Connections helped organise the launch, and Rev. Chris Mulherin chaired the evening. See Youtube clips of the launch talks by Dr Tony Ward and of Mr Russell Broadbent, on Nauru detention at tipping point, Visa over-stayers vs asylum seekers , the legacy of Nauru and The need for church unity on the issue of refugees. Thanks to Matthew Howard for his filming and editing of the launch. Dr Tony Ward will present a seminar on Bridging Troubled Waters at the Australian National University in Canberra, at the Coombs Extension Building 1.04 on Tuesday 17 October 2017, 12:30-1:30pm. Contacts: School of Regulation and Global Governance (Regnet) regnet@anu.edu.au, or +61 (0) 2 1625 0647.